We grow food year round, producing the freshest and tastiest Certified Organic vegetables and berries. The food we sell is grown exclusively on our own farm - no reselling and no buying at auctions and calling it our own. 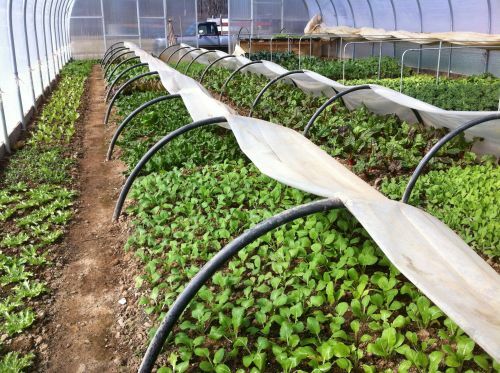 We raise all our vegetable plants from seed right here on the farm without using synthetic fertilizers or pesticides. Cultivating our vegetables requires a very limited use of fossil fuels each year because we farm mostly with our backs in the sun and hands in the soil. Furthermore, we limit our reliance on external sources by making our own compost, refusing to use black plastic sheeting over the soil, and growing all winter in a passive solar greenhouse that needs NO back up heat source. The bottom line is, we want to feel great about what we do and the quality of what we grow. That feeling is only possible for me if I follow my heart, which tells me that I am a steward of this land - not a dominant force. And I care for my farm based on the understanding that it is what sustains my community and family, not just a resource to be tapped. When a farmer strives for ultimate control over her farm, she will be disappointed. We aim to work within the natural systems of our land and micro ecology to grow our awesome tasting produce. This way, we're supporting our ecosystem and facing fewer production hardships since we aren't fighting with nature's cycles. What does this mean in terms of production? Using regular soil tests and constant observation, we keep soil nutrients, micro organisms, and aggregates in balance with compost, cover crops, naturally derived minerals and amendments, and don't add them if they aren't missing. Our goal is not to have the hugest of vegetables, but instead the MOST DELICIOUS! Huge can mean flavorless, and big tasteless vegetables, frankly, are a waste of space. We interpret system issues and problems based on what symptoms arise. For example, certain weeds can indicate deficiencies or excesses of nutrients and minerals in the soil. Vegetable crops could exhibit stress, telling us a piece to the soil puzzle is missing. Pest and disease pressure often means a farmer has not focused enough on crop rotation and soil health. The idea is very simple, but the practice requires diligence and a love of seeing the inseparable union of science and nature. 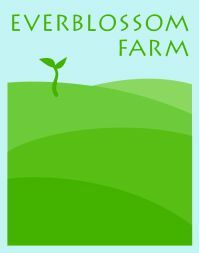 We love food at Everblossom Farm, and whether you're a farm laborer here or an eater of our goods, you'll come to realize that farming is more than just throwing seeds to the ground and reaping a harvest. For us, it's a connection to survival and happiness. And despite some overly challenging days and occasional disappointments, we're rewarded by this place and its provisions every single day. Tomato Canning Sale on the Farm this Week! Order now for pick up starting at 5:30pm Monday, September 19 or Tuesday, September 20. Simply email me the number of pounds you'd like by Monday at 1pm for Monday evening pick up, and Tuesday by 1pm for Tuesday evening pick up. OR stop by the farm and hand select your heirlooms from our bountiful porch market that we will have set up on Saturday, September 24th, 9:30am-1:30pm. * Our market will have other produce to choose from like sweet and hot peppers, herbs, cherry tomatoes, greens, okra, and more! *If you register for our Winter CSA at our market on Saturday 9/24, you'll get $10.00 off your market day purchase.